On the evening of 21st November, 1974, bombs ripped through two packed-out pubs in the English city of Birmingham. A total of twenty-one people were killed, ten in the Mulberry Bush and eleven in the Tavern in the Town. One hundred and eighty-two were left injured. The number of casualties would have been greater if the third bomb, left outside a bank, had also detonated. While no official admission of responsibility was ever made, the Provisional IRA was held accountable for the bombings. Sixteen years later, a programme by Granada Television, Who Bombed Birmingham?, named four PIRA men as having organised and carried out the attack. Seamus McLoughlin was said to have planned it, Mick Murray made the warning, James Francis Gavin had put together the explosives and Michael Hayes had planted them in the crowded bars. Mick Murray has been quoted in Chris Mullin’s book Error of Judgement as saying that the phone box he had tried to use for phoning in the warning had been vandalised and he was forced to find a substitute, delaying the warning getting through. Immediately after the bombings, six men were arrested on suspicion of carrying out the murders. They were Hugh Callaghan, Gerard Hunter, Richard McIlkenny, William Power, John Walker and Patrick Joseph Hill. All were Catholics from Northern Ireland who had lived in Birmingham since the 1960s. All except Hugh Callaghan had set off from Birmingham shortly before the explosions in order to attend the funeral in Belfast of an IRA volunteer who had been killed by his own bomb in Coventry. Patrick (Paddy) Hill also meant to visit his terminally ill aunt in Belfast. On arriving at Heysham, Lancashire, they were stopped and searched by police. The fact that they concealed the reason for their visit to Belfast would later be held against them in court. Informed of the Birmingham attacks during the search, the police took the five Irish men to the station at Morecambe for forensic tests. There, the men were questioned and roughly treated by the police. On the 22nd of November, they were handed over to the West Midlands Serious Crime Squad. Callaghan was taken into custody that evening. William Power would later claim that he had been assaulted by members of the Birmingham CID, and when the men appeared in court on 29th November, they showed bruises and other signs of ill-treatment. Seven months later, fourteen prison officers would be charged with assault, but were found not guilty in a trial presided over by Mr. Justice Swanwick. An attempt by the six men to press charges against West Midlands Police in 1977 eventually came to nothing. Finally rejecting the charges in 1980, Lord Denning said ‘just consider the course of events if their action were to proceed to trial ... If the six men failed it would mean that much time and money and worry would have been expended by many people to no good purpose. If they won, it would mean that the police were guilty of perjury; that they were guilty of violence and threats; that the confessions were involuntary and improperly admitted in evidence; and that the convictions were erroneous. That would mean that the Home Secretary would have either to recommend that they be pardoned or to remit the case to the Court of Appeal. That was such an appalling vista that every sensible person would say, "It cannot be right that these actions should go any further.'" At the age of 64, Paddy Hill described his interrogation by the police. ‘They jammed a pistol in my mouth and smashed it around, breaking my teeth so badly it was agony to even have a sip of water until I finally saw a dentist, two weeks later. They told me they knew I was innocent but that they didn't care: they had been told to get a conviction and that if I didn't admit to the bombing, they would shoot me in the mouth. They slowly counted to three, then pulled the trigger. They did that three times. Each time, I thought I was going to die.’ Hill was so badly beaten that his two-year-old son suffered trauma from the shock of seeing him afterwards. On the 12th of May, 1975, the Six were charged with murder and conspiracy to cause explosions. Three other men, James Kelly (James Francis Gavin), Mick Murray and Michael Sheehan were also charged with conspiracy. Kelly and Sheehan were further charged with unlawful possession of explosives. In the subsequent trial, admissions made by the Six during interrogation the previous November, despite their subsequent repudiation, were deemed to be admissible in court. Some circumstantial evidence was found to link John Walker to IRA members. Griess Test results appeared to show that Hill and Power had handled explosives, although the other four proved negative. At a later date, GCMS tests were negative for Power and contradicted the results taken from Hill. Forensic scientist Frank Skuse claimed that the test results showed with 99% certainty that Hill and Power had traces of explosives on their hands. This was opposed by defence expert Dr Hugh Kenneth Black, a former Chief Inspector of Explosives for the Home Office. However, Skuse’s evidence was preferred. The Six were found guilty of murder and sentenced to life terms. Mick Murray, a member of the IRA since the early 1950s and the man eventually named as ringleader of the Birmingham bombings, was sentenced to twelve years. He had remained silent throughout the trial, refusing to acknowledge proceedings. The trial judge, the Honourable Mr. Justice Bridge, commended him for ‘having all the demeanour of a soldier’. 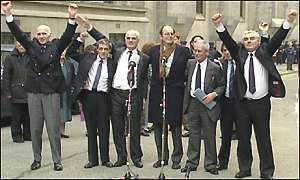 The Birmingham Six were to remain in prison for sixteen years. Their first appeal, launched in 1976, was dismissed by Lord Chief Justice Widgery. Several years later, journalist Chris Mullin began his investigation into the case for Granada’s World in Action series. The first of these programmes, broadcast in 1985, cast serious doubt on the men’s convictions. Mullins subsequently wrote a book, Error of Judgment, which presented the evidence for the men’s innocence. Mullins claimed to have met the men actually responsible for the bombings. The case was referred back to court, but in January 1988 the convictions were upheld. During the following three years, new evidence appeared in newspaper articles, television documentaries and books that further cast the convictions into doubt. Campaign groups calling for the men’s release formed in Britain, Ireland, the rest of Europe and the USA. A third and final appeal, in 1991, was successful. Paddy Hill was among those represented by the renowned human rights solicitor Gareth Peirce. Evidence was produced of police fabrication and the suppression of evidence. The discrediting of the confessions and the original forensic evidence was sufficient for the Crown to withdraw its case against the Six, and they were set free. A decade later, each of the men would be awarded substantial compensation. Paddy Hill went on to become one of the co-founders of the ‘Miscarriages of Justice Organisation’, a group whose aim is to reduce the numbers of miscarriages of justice and to improve care for those found to have been wrongly convicted. In 2006, they threatened to sue the Home Office Minister Fiona MacTaggart for libel after she made remarks about ‘criminals’ whose convictions had been quashed. They felt this implied that they were still guilty even after their acquittal. Four years later, Hill successfully sued the publishers of a poetry anthology who had referred to his conviction as ‘perhaps wrong’. Nine years after his release, Hill married an artist named Tara who he had met at a fundraising event for the Miscarriages of Justice Organisation. Tara describes him as a ‘tortured man’. ‘He’s difficult to live with but it’s not his fault; it’s because of what’s been done to him by the state.’ Hill himself says that he is emotionally dead. He hardly ever sees his children because he can no longer handle relationships. Writing in the Guardian in 2010, journalist Amelia Hill described Paddy Hill’s physical deterioration since his release from prison. He had ‘visibly shrunken’. On his release he had been a ‘strong, stocky man’ and one who appeared ‘resilient and determined to forge a future’. Nearly twenty years on, he is ‘frail’ and ‘looks broken’. The change was the result of psychological stress.